NASA will attend the SXSW 2014 festival in Austin, Texas. Hey Space Fans, if you're in Austin, Texas, attending the annual SXSW festival, NASA has some events planned that might peak your cosmic interest. "At SXSW Interactive in Austin, Texas, attendees will find out how NASA is answering the tough questions such as: Is there life on other planets? Are we smarter than the dinosaurs? What are astronauts studying on the International Space Station?" Editor's Note: If you see NASA at SXSW, let us know! We'd love to see your photos or videos of space themes at SXSW. You can send images and comments into managing editor Tariq Malik at spacephotos@space.com for potential stories or galleries. John Yembrick, NASA's social media manager, will lead a discussion about how technology has evolved the way the agency connects with the public. Just a few short years ago, only a select few were able to talk to astronauts in space. Today, all you need is to be on the Internet. At SXSW, audience members can ask questions directly to astronauts Mike Hopkinsand Rick Mastracchio from 250 miles away – in space. "You don't have to go to the movies to feel connected to human spaceflight,” Yembrick said. "Every day on social media astronauts on the International Space Station are sharing their experience with us down here on Earth. The station is not only an outstanding test bed for future space exploration, but also at providing us the human perspective of looking back at our home planet from orbit. Like never before, we can live vicariously through the eyes of the astronauts." NASA has a fleet of spacecraft studying every aspect of our home planet with five new missions launching in 2014. This panel will demonstrate how NASA is using mobile applications, interactive websites, near real-time visualizations and social media to deliver meaningful and understandable Earth science data - in some cases just hours after it's collected. Representatives from JPL on this panel include Michael Green, manager for public engagement formulation, Doug Ellison, visualization producer, and Veronica McGregor, media relations manager. 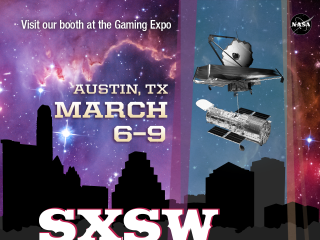 Kerbal Space Program and NASA will share the stage at SXSW Gaming during SXSW. Their panel will offer the first look at the in-game mission as well as discuss the process of taking a real mission that is still highly conceptual and assembling it in Kerbal Space Program. NASA will be represented at the panel by Jason Townsend, Deputy Social Media Manager, and Jason Kessler, Grand Challenges Program executive, who leads NASA's efforts to "find all asteroid threats to human populations and know what to do about them." "First Signs: Finding Life on Other Planets" panel will feature NASA scientists working on the James Webb Space Telescope. Amber Straughn, NASA Deputy Project Scientist for JWST Communications and Outreach, and Natalie Batalha, Research Astrophysicist at NASA Ames Research Center will join other panelists to discuss the important contributions this telescope will make in the search for life in the Universe, and set the stage for how JWST could find the first signs of life on another planet. NASA is using prizes and challenges to help solve world big problems – like that of a potential asteroid strike. Kessler and colleague Jennifer Gustetic, Prizes and Challenges Program executive, will talk about how open innovation can meaningfully engage people in space, provide funding opportunities to developers, makers & entrepreneurs, and help us solve problems of global importance at a panel called "Are We Smarter than the Dinosaurs?" on Monday, March 10. "66 million years ago, the dinosaurs had a very, very bad day thanks to a really large asteroid," Gustetic said. "NASA has led the global effort to find potentially hazardous asteroids, but there's still work to do and it will take a global effort with innovative solutions through participatory engagement to complete the survey of smaller, but still potentially hazardous asteroids. The general public will be able to talk with scientists and engineers working on the James Webb Space Telescope and the Hubble Space Telescope and view a 13-foot-tall model of part of the Webb telescope at the SXSW Gaming Expo. The Expo takes place Friday, March 7 through Sunday, March 9 at the Palmer Events Center, 900 Barton Springs Road, Austin, Texas. Badged SXSW Interactive participants can check out the "Experience NASA" exhibit Sunday, March 9 through Wednesday, March 12 at the SXSW Tradeshow in the Austin Convention Center. This exhibit will feature some of NASA’s most exciting missions, including our Mars Rovers, the soon-to-fly Orion space capsule, the Space Launch System, and theAsteroid Grand Challenge, which seeks public participation. NASA will also host a Space Meetup on Monday, March 10 at 4 p.m. where participants can meet fellow space enthusiast – along with NASA staff from multiple programs, missions, and projects – all at the NASA exhibit. For the latest updates from NASA events at SXSW, follow NASA on Twitter, Facebook, Google+ and Instagram. You can also join the conversation using the hashtag #NASASXSW.